Today I went with a new friend to an art exhibit at the Tokyo Museum of Western Art. The artist was Durer. She was very familiar with him because she served a mission in Germany. I remember his work from my art history class. It was interesting because most of the works exhibited were from the birth and crucifixion of Christ and Japan is not a Christian country. I find that many times I am disappointed by special exhibitions in Japan. They tend to never have any of an artist’s great or famous works. For example, the Vermeer exhibit we went to a few years ago included many sketches and only one painting. 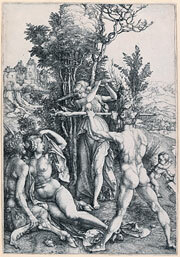 I did enjoy the Durer exhibit, but longed to see more than his woodblock prints.